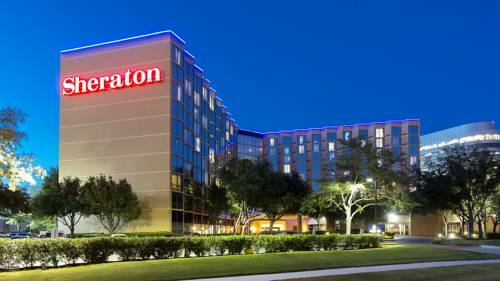 Discover Sheraton Houston Brookhollow Hotel, conveniently located minutes from the Galleria and downtown at Interstate 610 and U.S. Highway 290. Both George Bush Intercontinental Airport (IAH) and Hobby Airport (HOU) are easily accessible.Each of our 382 guest rooms, including 82 Club Level rooms and 14 suites, showcases the latest Sheraton innovations. Relax in our Sheraton Signature Sleep Experience. Enjoy incredibly fast High Speed Internet Access at no charge, a flat screen television, and a spacious work desk with an ergonomic chair. Upgrade to our Club Levels for exclusive access to the Sheraton Club Lounge, which offers complimentary breakfast Monday through Friday, and afternoon hors doeuvres and beverage options Monday through Thursday.Our Houston Brookhollow hotel offers free parking as well as complimentary transportation to the world-famous Galleria and select shopping, dining, and entertainment venues nearby. Get energized at the fully-equipped Sheraton Fitness center or lounge by the outdoor pool. Enjoy complimentary High Speed Internet Access as well as access to PC workstations with printing services, and more. Sample the Tex-Mex at Cimarron, one of Houstons great restaurants, for breakfast, lunch, and dinner; and relax with a cold beer, a glass of wine, or a refreshing cocktail in Tuxedos Lobby Bar. You can also indulge in a private meal via our room service.Event planning is easy with 15,200 square feet of lobby-level meeting space, including the 8,000-square-foot Grand Ballroom. Make your Houston meeting memorable with enhanced audiovisual services and ultra-fast broadband capabilities. Take advantage of our Bridal Suite on your big day. Whether youre planning a meeting, a conference, a retreat, a wedding, or a special event, our dedicated Convention Services staff is ready to assist in planning your next gathering down to the last detail. We are conveniently located just minutes from the Galleria and downtown Houston, at the intersection of Highway 290 and Loop 610. Shop 'til you drop at the Galleria, Uptown Park, or the Northwest Malls. Take in a baseball game at Minute Maid Park. Or dine in one of Houston's nearby restaurants offering the ultimate in variety. Enjoy a cocktail or an ice-cold beer in Ella s Table Bar, which has great food and drink specials during happy hour. Ella s Table Restaurant serves exceptional cuisine throughout the day in a comfortable and friendly atmosphere. It s the perfect place to relax on the weekend or unwind after a long day of work in a casual, inviting environment.